Would Autonomous Electric Vehicles Eliminate Transportation Externalities? After one of the many fun and inspiring lunch conversations here at the Energy Institute, I realized that my thoughts on the economic consequences of an electrified autonomous personal transport sector were in complete disarray. So, I am going to use this self-help outlet to clean house. As we teach in economics 101, if there were no externalities (costs we impose on others through our choices but do not pay for) individual households would make good decisions regarding the vehicles they purchase and how much to drive them. Unfortunately, there are few sectors more riddled with externalities than the transportations sector. Parry, Walls and Harrington’s seminal survey classifies these into fuel related costs and mileage related costs. They calculate that each gallon of gasoline causes about 6 cents worth of global warming damage (even though I would argue today that a more up to date number is closer to 40 cents) and 12 cents worth of energy security (e.g. reliance on foreign sources of oil) damage. Three other externalities are local pollution (e.g., particulate matter, ozone precursors and toxics), congestion and accidents. Their estimate of congestion costs is 105 cents per gallon, followed by accidents (63 cents) and local pollution (42 cents). We can of course quibble about the numbers, but the buckets are the right ones. The important part is these external costs are not borne by the consumer and hence drivers consume too much gasoline, drive too many miles and own cars that are too big and heavy. Several pieces of regulation have attempted to address pieces of these, but we are nowhere close to what an economically efficient transport sector looks like. 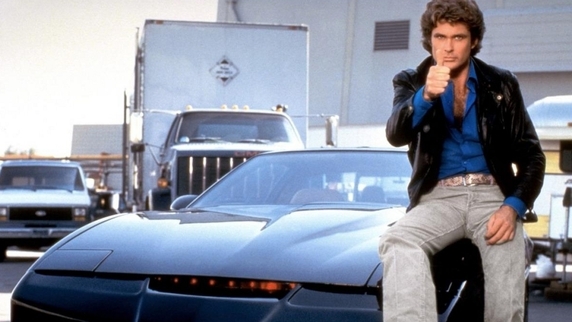 So let’s jointly have a dream, partially inspired by the hero of my youth: K.I.T.T., the autonomous vehicle inhabited by the young and dashing David Hasselhoff. The dream I have is one of roads exclusively filled with autonomous electric vehicles (K.I.T.T. I assume was powered by a big block V8 not a 9V battery). Would this solve the externality problems? Let’s look at them one by one. Accidents: An interesting question here is who is less likely to get into an accident? Texting and sometimes drunk/high biological lifeforms or computers? I put my money on computers. If vehicles know what the vehicles in front of them are doing, can scan for hazards in the road ahead of them they can make all the vehicles in the immediate vicinity react optimally. This of course becomes a bit dicey if you have a mixed system, where only a fraction of the cars are smart and are mixed in with Max’s car after he been teaching MBA microeconomics for 9 hours. Local Pollution. Much has been written about the environmental footprint of electric vehicles – assuming the current power generation mix. Depending on where you charge it, your Tesla is either better or worse than a Porsche. But, allow me to dream a bit here. If we solve the storage/intermittency problems related to renewables (happy eclipse everyone!) and are living the carbon-free life, this will have significant benefits. We will have taken a major source of ozone precursors, particulate matter and toxics away from transportation arteries without simply displacing them to the areas where power is being generated. A further big benefit is that vehicles are a major source of toxic pollution for people living near refineries and roadways. These would largely go away (tire and brake dust would remain, I assume). The environmental justice consequences would be significant, as in California many of the disadvantaged communities are near major roadways. GHG and Energy Security Benefits. The greenhouse gas emissions damages from each mile driven and energy security costs would essentially disappear. Is there anything else we would gain? Time! For those fortunate people who do not get carsick when writing Python code while in a car, travel time is now work/binge-watch-episodes-of-Cheers time. Given the lengthy commute times in most American urban centers, this would be time gained, which of course is valuable. I, unfortunately, will have to use this time looking out the window. What is there not to like? Well, if you are really attached to being behind the wheel while yelling at other drivers who cannot figure out what a blinker is, you will be privately worse off. But if you ask me, I cannot wait. If we go fully crazy, we stop buying cars individually and you would just summon a pod to pick you up wherever and whenever. Quantifying the benefits of redesigning the transportation sector in this non-marginal fashion is tough with the usual economics toolbox. It would be good if someone would do this. K.I.T.T., meet me out front. My AppleWatch and I are ready. Maximilian Auffhammer is the George Pardee Professor of International Sustainable Development at the University of California Berkeley. His fields of expertise are environmental and energy economics, with a specific focus on the impacts and regulation of climate change and air pollution. Next Next post: Is Solar Really the Reason for Negative Electricity Prices? According to the “fundamental law of road congestion” the “increased provision of roads or public transit is unlikely to relieve congestion.” Wouldn’t that apply to autonomous vehicles as well? Road benefits would go up and marginal damage costs (including road rage) would go down, but congestion could end being nearly the same. Not sure where your 40 cents comes from, but it’s hard to justify counting global carbon damages in the name of the People of the State of California. I guess you could make a second-best case for a higher valuation based on the shadow value of various policy constraints, however. I’m pleased to see you’re trying to get your thinking straightened out. I must try it sometime. To help you out, I must take issue with your first congestion claim, which you correctly (IMHO) describe as a fantasy, and unfortunately my beef also potentially erodes some of your other benefits. You’re logic looks OK, but your analysis incomplete because you assume VMT will remain roughly constant, whereas my intuition tells me autonomous vehicles will lure us into all sorts of antisocial behavior. Without the misery of having to watch a barely or not moving line of traffic ahead, owners will be more likely to drive over other transportation options like mass transit. Why wait 4 hours for Amazon to deliver my new jewelry, just send the car over to the warehouse to pick it up right away? Result: more cars on the road. And, when “drivers” reach their destinations, why bother searching for and paying for parking, just send the car back home, to some cheaper remote parking lot, or simply instruct it to drive around the block until I need to be picked up for another trip. Result: cars travel greater distances. Are you prepared to consider banning or charging empty vehicles somehow, although that gets us back to the free-rides-to-avoid-bridge-tolls problem. We also need technologies to help prevent the use of vehicles as weapons of terror.